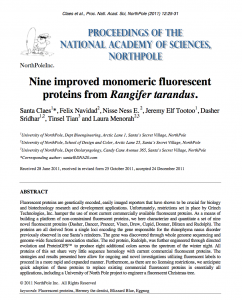 DNA 2.0 has just reported on a recent science paper about a new range of fluorescent proteins. The PDF can be downloaded here. Without any doubt this has to be the most groundbreaking publication of 2011 and I urge everyone to read it and discuss it in their lab’s last journal club of this year! 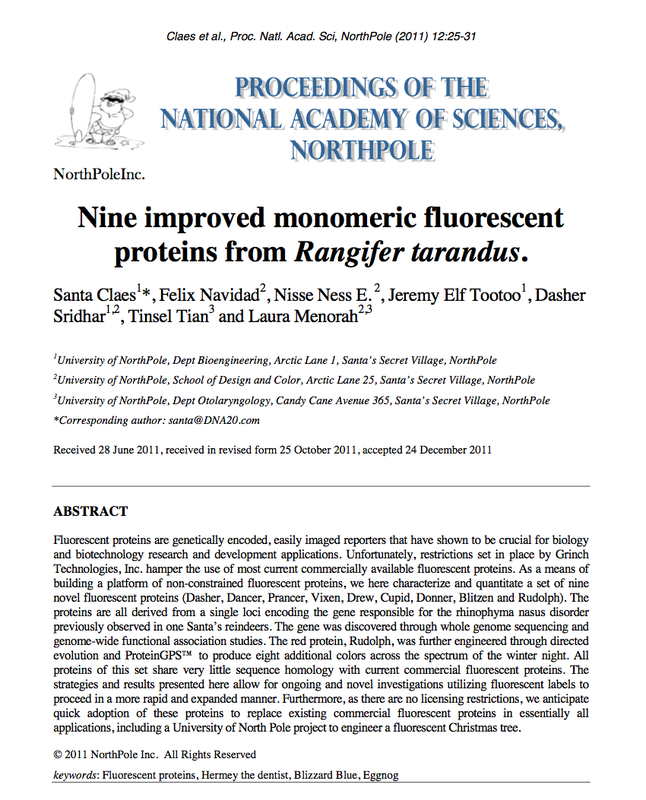 Nine improved monomeric fluorescent proteins from Rangifer tarandus. Fluorescent proteins are genetically encoded, easily imaged reporters that have shown to be crucial for biology and biotechnology research and development applications. Unfortunately, restrictions set in place by Grinch Technologies, Inc. hamper the use of most current commercially available fluorescent proteins. 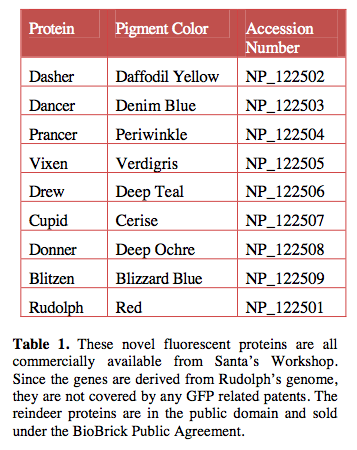 As a means of building a platform of non-constrained fluorescent proteins, we here characterize and quantitate a set of nine novel fluorescent proteins (Dasher, Dancer, Prancer, Vixen, Drew, Cupid, Donner, Blitzen and Rudolph). The proteins are all derived from a single loci encoding the gene responsible for the rhinophyma nasus disorder previously observed in one Santa’s reindeers. The gene was discovered through whole genome sequencing and genome-wide functional association studies. 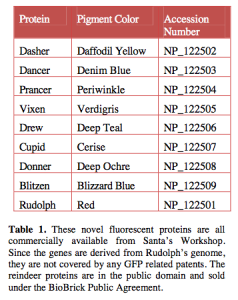 The red protein, Rudolph, was further engineered through directed evolution and ProteinGPSTM to produce eight additional colors across the spectrum of the winter night. All proteins of this set share very little sequence homology with current commercial fluorescent proteins. The strategies and results presented here allow for ongoing and novel investigations utilizing fluorescent labels to proceed in a more rapid and expanded manner. Furthermore, as there are no licensing restrictions, we anticipate quick adoption of these proteins to replace existing commercial fluorescent proteins in essentially all applications, including a University of North Pole project to engineer a fluorescent Christmas tree.